We supply pure milk from our own dairy farm. We also supply butter, desi ghee, yogurt, butter (makhan) and fresh cream. Home delivery facility is also available. 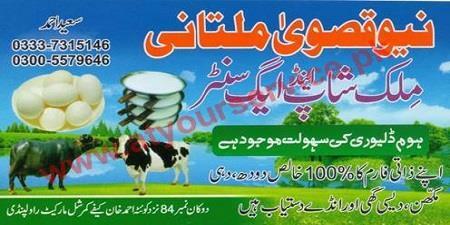 New Qaswa Multani Milk Shop & Egg Centre is located in Commercial Market, Rawalpindi. it supplies pure milk from own dairy farm. Butter, desi ghee, yogurt, butter (makhan) and fresh cream are available. Home delivery facility is also available.